The Polish financial concern Getin Holding had recently purchased a Romanian banking and lending company and sought to rebrand with its own "Idea Bank" brand. To implement the brand in Romania, they hired Brandient. The localised brand launched on April 22. Brandient's strategy was rooted in the name "Idea" as an expression of its positioning, "building on a promise of simple, fresh, flexible products and services". The existing logo used by Idea Bank in Poland was subtly refreshed by placing its four dots symbol between Idea and Bank, thereby helping establish "Idea" as a masterbrand for various sub-brands (such as Idea Leasing, Idea Expert and Idea Brokers). The double dots can also be used as a double colon or hashtag in advertising and other communication. Wizz is a major Hungarian budget airline that operates in much of Central and Eastern Europe. This week, on the eleventh anniversary of its inaugural flight, the airline unveiled a refreshed corporate identity and livery, created by Futurebrand. The airline says it now has "a fresh, more vibrant, sophisticated look and feel". Last April brought new identities for several international and local brands around the world, the most important of which are presented below. This includes printer maker Lexmark, a major French energy utility, Hewlett Packard's enterprise division and several others. Brasília is the capital of Brazil, and the federative unit it is located in is known as the Distrito federal. At least it was until a month ago, when the governor revealed a new logo for the city that rebrands it as Governo de Brasília. The logo itself is a pretty straightforward application of the district's flag and coat of arms. The applications are equally straightforward. Rett i koppen ("Straight in the Cup") is a popular Norwegian brand for powder that is mixed with water to create soups and drinks. Earlier this year, it was given a new look, created by Norwegian agency Grid. The brand was last overhauled about two and a half years ago (by London agency LFH) in an effort to halt slumping sales. Evidently, it didn't do the trick as sales have continued to decline. The new design platform should communicate the positioning "a warming pause". It reintroduces product shots as a central part of the packaging, something that had been lost in the last redesign. The Spanish company Grupo Norte was originally founded as a cleaning company in 1972, but has since expanded to provide a variety of supportive services and now also operates in Chile and Peru. Last month, on April 7, it launched a new visual identity, created by Futurebrand Madrid. Futurebrand says it has created a clearer brand architecture that communicates "excellence, strength and improvement". The logo includes a small arrow that points north, a reminder of its heritage, coloured an "optimistic green". Slovak public broadcaster RTVS has two TV channels and they were recently both given new looks. Several studios were approached, but the assignment was given to Czech motion studio Oficina. Their task was give the channels distinct identities and to bring in dynamism and modernity to shift perceptions of the channels. The previous graphics packages were introduced back in 2012, along with the current logos (as described here). The new looks convey the different profiles of the channels, with an inclusive feeling for the generalist channel Jednotka (Channel 1) and a more abstract look for the specialist channel Dvojka (Channel 2). A recurring theme in both packages is the use of two dots that form the colon that is part of the channel logos. The channel idents for Jednotka start with everyday situations. The colons then 'open up' a window where the scene has progressed in time and space. 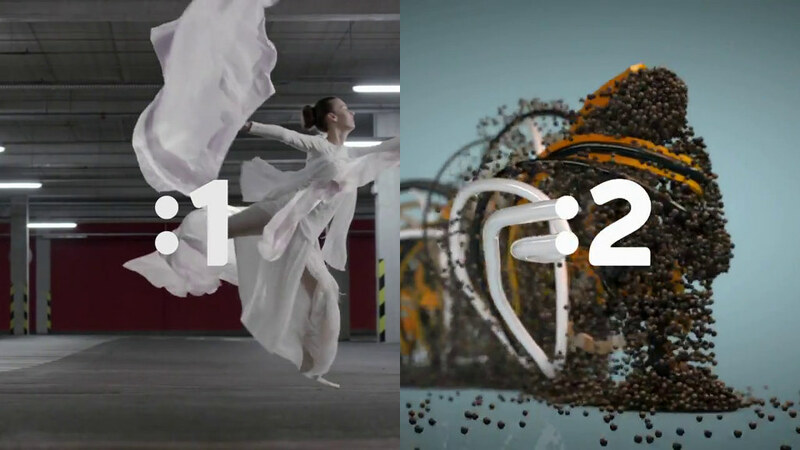 In Dvojka's idents, the dots move through abstract shapes before forming the channel logo. The idents will change throughout the day to reflect Dvojka's varied programming which includes both the arts, current affairs, sports and children's programming.